When I am not doing a proper job Simon Miles is a landscape photographer based in Devon in England's beautiful West Country. Great British Landscapes has published a number of articles on tilt-shift lenses so most readers will be familiar with the basics. 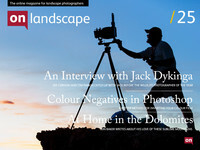 The tilt facility (see Issue 12) is probably of most interest to landscape photographers. With a little practice and a planar (flat – or flattish) subject, this simple movement borrowed from large format cameras can provide front to back sharpness with almost any focal length. The only real problem is price. Proprietary tilt-shift lenses cost in excess of £1000. You can double that if you fancy one of the new Schneider PC-TS lenses. Not an easy purchasing decision to justify to your wife or significant other. So what to do? One possible solution is to buy a second hand film-based view camera system. If you shop around you can buy a decent two or three lens kit for the price of a single DSLR tilt-shift lens. This need not be a full-blown large format outfit. For example, earlier this year I acquired a 6x9cm medium format view camera, which combines many of the benefits of large format (including all of the same movements) with the economy and convenience of rollfilm. This works very well. But I confess there are times when I just want to work with a DSLR. And what about all those people who don’t use film at all? Once again, film photography has the answer, this time in the shape of second hand medium format lenses and adaptors. After a brief search on Ebay, I bought a Zeiss 80mm Planar and Hartblei tilt adaptor for my Canon 5D2 for just £450. I could have paid less, but I wanted a nice clean lens. Even so, that’s less than half the price of proprietary tilt-shift lenses. The new Schneider PC-TS 90mm Makro-Symmar costs a staggering five times as much. Notice that I bought only a tilt adaptor, as I am not really interested in using shift with this focal length. But if you want tilt and shift you can have it for another £100 or so. So how good is it and what, if any, are the compromises? Let’s deal with the question of quality first. The Zeiss lenses, made for the Hasselblad V series cameras, are top-flight optics of the highest quality. They are designed to cover the 6x6cm format, so have the necessary coverage to offer reasonable movements on full-frame or APS-C format DSLRs. I bought a Planar 80mm F as it is reasonably compact and has no built-in leaf shutter (which you won’t be using anyway). But any of the V series lenses will do the job. And what a job they do. Captures are tack sharp right across the frame with a beguiling combination of warmth, depth and dimensionality, which is the hallmark of Zeiss glass. The tilt adaptor provides up to eight degrees of tilt by means of a ball and socket arrangement. It is small, light and easy to operate by means of a large and nicely dampened collar. Live View is essential for critical focusing and allows very precise adjustments to be made. The tilt mechanism can be rotated allowing for tilt, swing or compound tilt-swing movements. Although various manufacturers offer tilt and tilt-shift adaptors, it is worth noting that Hartblei has considerable expertise in the manufacture of tilt-shift lenses. In fact, they offer their own range of (very expensive) modified Zeiss lenses. I was therefore confident that the Hartblei adaptor would be up to the task, and so it proved to be. And what of the compromises? To my mind, these are few and easily outweighed by the outstanding optical quality. The main consideration is the need to manually stop down the aperture, just as you do with real view camera lenses. Stop down metering is possible, but requires a degree of manual compensation, particularly with movements. You can avoid this problem by using a handheld light meter. Incidentally, if all this sounds a bit basic, you might like to know that the Schneider (or Scheißteuer for those who know their German) PC-TS lenses work in exactly the same way. A further limitation is the lack of suitable wide-angle options. The widest commonly available Hasselblad lens is the 40mm Distagon. This is a highly sophisticated and expensive ultra-wide on its native 6x6cm format but only a moderate wide-standard on a full-frame DSLR. However, tilt – so essential on the large format – is often not necessary with wide-angle DSLR lenses, because of their inherent depth of field. With longer focal lengths, on the other hand, tilt can provide a degree of front to back sharpness that no amount of stopping down would achieve. Therefore, if I were to buy just one tilt-shift lens, I would skip the wide-angle option in favour of a standard or short telephoto lens. The 80mm Planar is a long-standard focal length on a full-frame DSLR. This is an excellent choice for isolating the subject when making detailed studies of the intimate landscape. Add in the tilt capability and you have the perfect lens for extracting the kind of fine detail that this approach demands. Combine it with a wide-angle zoom and you have an excellent lightweight two-lens kit that won’t break the bank. Want something longer? No problem. How about a 100mm Planar or 120mm Makro-Planar? Longer telephoto designs are not recommended, however, as the nodal point is positioned out in front of the lens, causing the image to shift alarmingly when tilted. Tilt-shift lenses are not for everyone. Some will no doubt feel that nothing less than a large format view camera is good enough. Others will prefer the speed and spontaneity of normal DSLR lenses. However, if you are interested in exploring the unique possibilities of tilt/shift on a DSLR, the Zeiss/Hartblei offers a great combination of reasonable cost, moderate size/weight (about 600g with adaptor) and superb image quality. Some of you may already have some old Hasselblad lenses just waiting to be pressed into service, in which case the Hartblei adaptor begins to look like quite a bargain. Even your wife will approve (maybe).